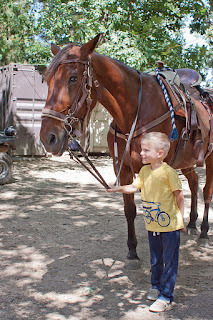 I've always loved horses and riding, but in the past the kids have alternated between enjoying pony rides and being terrified of the little horses. 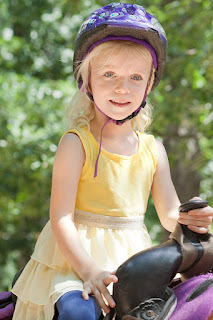 So when they begged to go riding this summer, "On real horses, Mommy. Not ponies," I happily agreed. 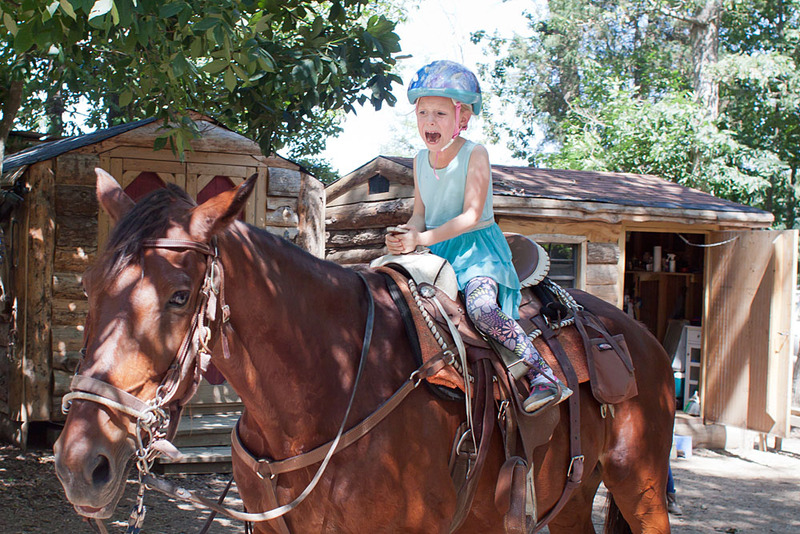 We went to a modest little horse farm outside the city and signed the kids up for 20-minute rides. Little Man and Sweet Pea went first. 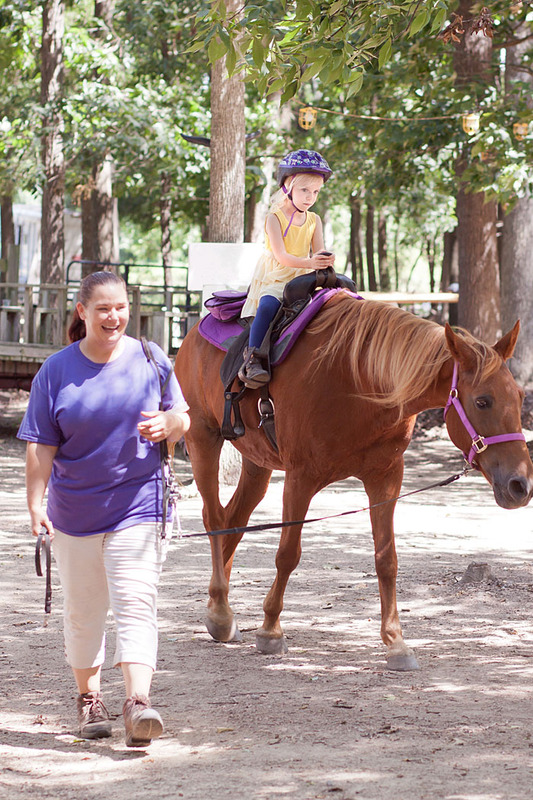 Sweet Pea was a little nervous riding a mare named Gypsy, but she held on tight to the saddle horn and did fine. Little Man was a natural! He wasn't scared at all up on Billy Jack, and almost immediately the employee started giving him a riding lesson. 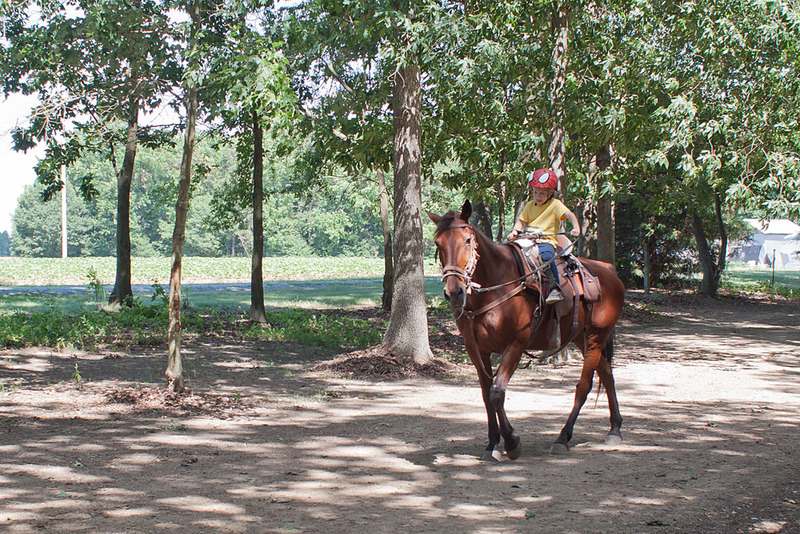 Before long, Little Man was riding entirely on his own, with no adult holding onto a lead or anything. 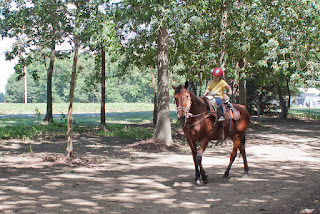 He was steering Billy Jack left and right, bringing him to a stop, and starting him up again. It was so much fun to watch! Then it was CC's turn. I thought that watching her siblings go first would ease her mind, but it ended up doing the opposite. Despite all her earlier please for riding lessons, she refused to get up on Billy Jack. Ultimately she allowed herself to be lifted into the saddle with the promise of ice cream afterwards, and that's the only thing that kept her on that horse's back. "Have I earned my ice cream yet, Mommy? Can I please get off this horse?!" Never underestimate the power of ice cream for a 7-year-old. Later, I told her I was proud of her. Yes, Little Man and Sweet Pea might have had longer rides, and learned more about handling their horses, but CC faced up to a big fear of hers and managed to stay on the horse for a full lap around the barn. "You know, Mommy, Billy Jack was actually really gentle. I think I would ride him if we went back there and tried again." Yeah, right, kid! Maybe next year.